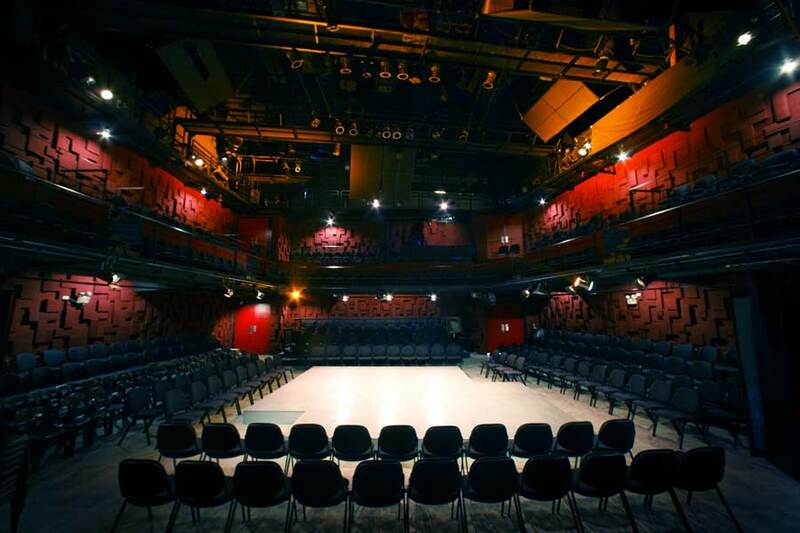 At the heart of the PETA Theater Center is a “Black Box” performance space known as the PETA-PHINMA Theater. It is a flexible and intentionally skewed box theater that offers numerous stage and audience arrangements reflecting PETA’s exploratory and nonconventional spirit. It may be an Arena, an End Stage, or Thrust Stage using various platforms, thrusts, ramps and extensions as imagined or required by each production. The audience may be seated in varying arrangements given movable yet comfortable seats on the ground floor orchestra and several rows of seats along a three-sided balcony on the second floor. There are multifunctional catwalks above, topped by an acoustic ceiling and movable reflectors. The theater is capped by an ingenious roofing system that is rated for rain, heat and noise. The PETA-PHINMA Theater is clad in a customized “PETA Red” glow. The space allows the user a smooth floor of movement. There are ample entrances and exit doors that connect the lobby, theater and backstage. Technicians, designers, and artists will appreciate access and freedom of movement between service panels, control areas and attachment points for lights, sound, decor, and even personnel through the ten catwalks above at various elevations. Last but not the least, this theater is meant to be safe and sound with multiple fire and safety systems installed and managed by a dedicated staff.